Successfully Added 10.4 Inch Roof Mount Monitor DVD Player - USB + SD Reader -Tan to your Shopping Cart. The easiest and most affordable way to transform your boring ride into a full multimedia entertainment center. Roof mounted monitor and DVD player with added USB and mini USB port and a SD card reader for easy viewing of your digital files. Very easy to install and use, with a push of the button this 10.4 Inch TFT LCD ceiling monitor will flip down and display everything from movies to music to pictures with sharp clarity. As an added bonus, there is a built in FM transmitter for easy playing on your own FM Radio, 2 AV OUT for moving the pictures to other monitors, and an AV IN for showing images directly from other devices. 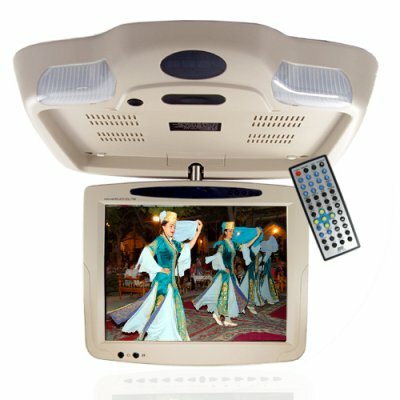 A great addition to any car entertainment system available direct from Chinavasion at a low wholesale price.